Jennifer Jones's final stone wrapped up a 6-3 victory for her team in today's gold medal match against Sweden, capping off the Canadian team's unbeaten Olympic run. 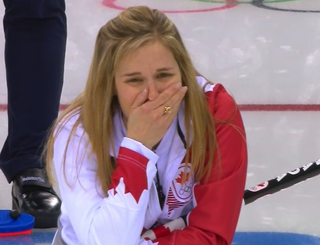 While watching her shot slide down the ice, the 39-year-old Jones couldn't help but get a little emotional. One thing that's cool about the Olympics is happy Olympians. Jones won the first gold medal of her curling career today, and brought Canada its first gold in the women's sport since 1998.